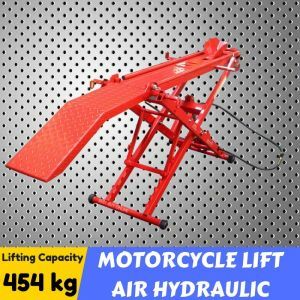 Our motorcycle lifts have been designed to elevate motorcycles and ATV’s to comfortable working heights so you can work on your auto maintenance or repair projects effectively - saving your time & energy. 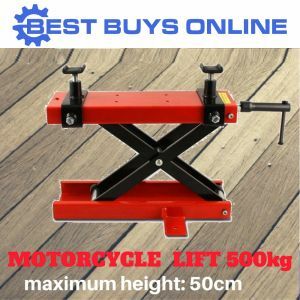 Easy-to-use, superior wide platform and exceptionally durable, they are the very best choice for any motorcycle enthusiast. 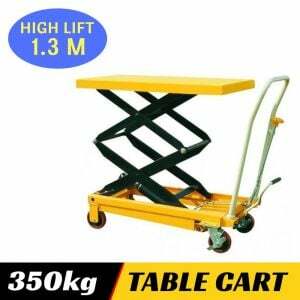 The 680kg capacity electric motorcycle lift is one of the largest lifting tables on the market today. 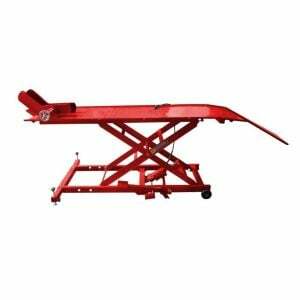 Fully equipped with extensions and accessories, this table allows you to work on your larger and heavier recreational vehicles. POWERFUL & SUPERIOR: This motorcycle lift is capable of lifting a huge 680 kg. It is complete with an extra large platform, allowing you to access every area of the motorbike in a comfortable way. RELIABLE, EASY & SAFE TO USE: For added ease of use, the unit comes with an air hydraulic jack. Its electric power unit gives the table a smooth and gentle range of motion. STABILITY: It comes with 2 pieces of ramp to assist in loading the motorcycle and a front wheel clamp to keep the bike stable. DURABILITY: Built to last, it has been designed with powder coated steel frame for heavy duty loading capacity.